The dogs get a session on the park, I follow Steve McClaren’s third game in charge of Derby on the radio, where he remains unbeaten after three games, and then we head into town for the evening. After a few pints in Langtry’s, we move on to Broadway where we watch 'Captain Phillips'. This is Hollywood’s retelling of the hijack of the container ship MV Maersk Alabama by Somali pirates in 2009. 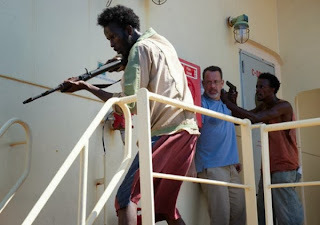 Tom Hanks plays the man himself Captain Phillips. The Alabama was heading toward the horn of Africa with a full load when it was attacked by two skiffs of armed Somalis. 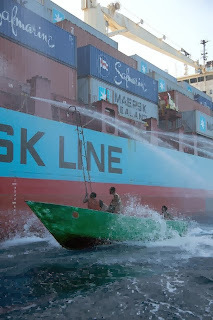 The ship basically puts the hammer down, creating such a wake that the skiffs give up but the next day they are back. This time they have a better boat and better tactics, they get alongside and board the Alabama. 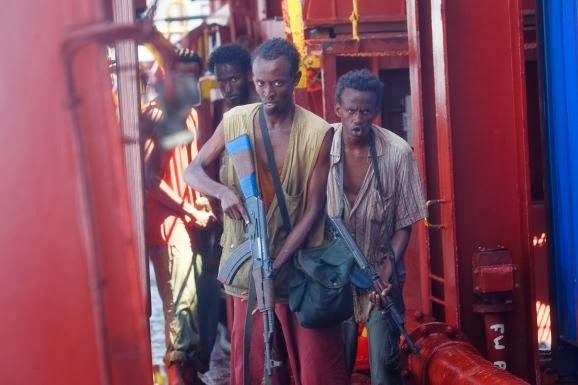 The Somali pirate leader Muse (Barkhad Abdi) and his four henchmen head to the bridge, going through some pretty ineffective locked gates. 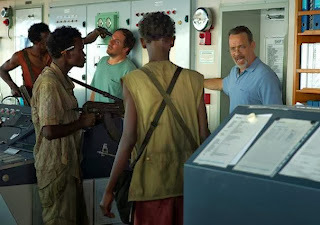 Once on the bridge they hold Phillips and a few other crew members hostage at gun point. Meanwhile the rest of the crew are below deck hiding. The crew manage to confuse the hijackers by shutting the power down and one of hijackers cuts his foot in the darkness on some broken glass that has deliberately been left out. Phillips then convinces them to cut their losses, take the money that is in the safe, and leave in the lifeboat. Unfortunately they decide to take Phillips with them. In pursuit though is not only the Albama itself but also the US Navy who have no intention of letting the Somalis get back to shore. It’s a decent film but for me the whole thing falls down the minute they get into the lifeboat. There is great tension to the film at first, when the pirates are approaching the ship, when they board it and when they’re on it searching for the crew. All this time there is a sense of being trapped in the middle of nowhere with no cavalry about to come over the horizon and we know not who of his crew are going to live or die. Unfortunately once Phillips is on the lifeboat and isolated from his crew, its story over because we know he lives and for me at least the tension just going down the pan. In fact the last hour or so spent on the lifeboat just seems to goes on and on and crawls to the expected conclusion where a rescued Phillips ends up in the care of the most unsympathetic nurse you've ever seen. I suppose Hollywood often changes endings but I just didn’t see them changing a survival to a death, unfortunately. The best thing here is the battle of wits and wills between Phillips and Muse, and it is interesting to hear the pirates take on things but it’s not enough. The film needed another angle which it just didn't have. Like a distraught family at home, desperate for news of him, to give the film a much needed emotional angle but it wasn’t there. It all felt a bit hollow in the end and at least 30 minutes too long.